The biscuits are best on the day they are baked but you can make the dough ahead of time, cut and freeze, then thaw right before baking. One week prior to serving: Wash, dry, and remove any stems from the tomatoes. Using a toothpick, poke a small hole through each tomato, end to end. In a one quart saucepan over medium heat, combine the vinegar, sugar, and salt with 3/4 cup of water. Bring to a simmer, stirring until all sugar and salt is dissolved. Fill a clean glass container with the tomatoes. Add the peppercorns, coriander, allspice, bay leaves, and garlic to the container. Pour the hot brine over to cover completely, discard any leftover brine. Let cool completely, then refrigerate for 1 week prior to serving. Can be stored refrigerated for up to 1 month. The day prior, preheat the oven to 400˚ F. Pierce the sweet potatoes with a fork and place on a foil lined baking sheet. Bake until tender, or a fork passes easily through the potatoes, about 45 minutes. Let the potatoes cool slightly, then peel and puree in a food processor. Refrigerate overnight. The next day, measure out one cup for the biscuits. Preheat oven to 450˚ F. Line a sheet tray with parchment paper. In a small bowl, whisk together 1 cup of the chilled sweet potato and the buttermilk. Place back in the refrigerator to keep cold. In a large wide bowl, combine flour, brown sugar, baking powder, baking soda, and salt. Using a pastry cutter or two knives, cut the butter into the flour until the butter is the size of peas. Add the sweet potato/buttermilk mixture and mix until just combined and a soft dough forms; try to avoid over mixing. Turn the dough out onto a floured surface. Flour your hands and pat the dough carefully into a round shape then flatten the dough to 1-inch thickness. Cut as many biscuits as possible with a floured 1½” metal biscuit cutter. Place the biscuits on a parchment lined sheet tray. Pat the remaining dough together and cut out the remaining biscuits. Bake 13-14 minutes or until lightly browned. Makes 30 mini biscuits. Cut 6 slits down the length of the jalapeño almost to the bottom; cutting through just the skin and membrane but not completely cutting open the pepper. Be careful when preparing the pepper, the idea is to just cook out the flavor so you don’t want to cut it completely open. In a small saucepan, add the jam, sugar, vinegar, molasses, salt and jalapeño. Bring to a simmer and reduce the heat to low and continue to simmer for 20 minutes. Remove from the heat; remove and discard the jalapeño. Strain the sauce through a fine mesh strainer; set aside. Preheat the oven broiler. Cut the biscuits in half and spread on the halves ¼ teaspoon per side with fresh jalapeno & raspberry sauce. Top with ½ piece of country ham, folded or torn to fit, and ½ piece of cheese. Place under the broiler to just melt the cheese. 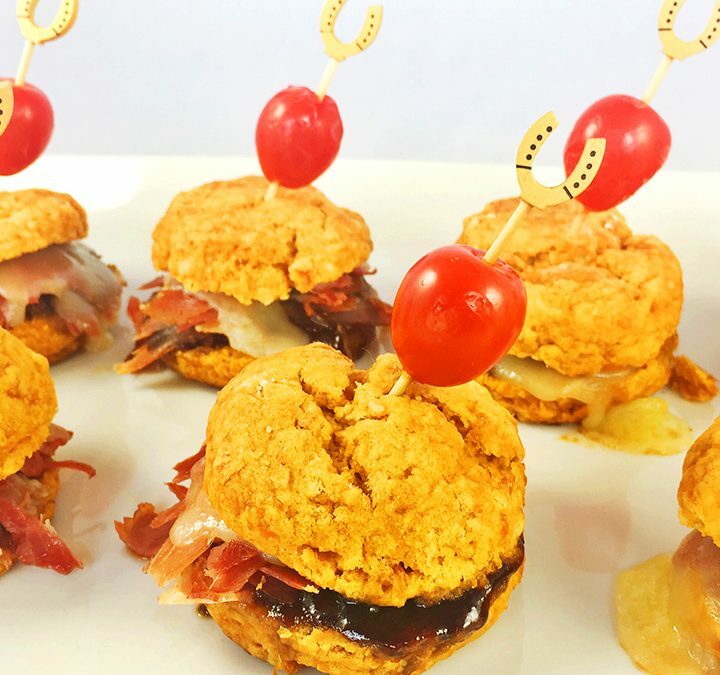 Remove from the oven and top with the other biscuit half and a sandwich pick fitted with a pickled cherry tomato. Makes 30 mini biscuit sandwiches. Superbowl and Chicken Wings go hand-in-hand. These sweet, sticky wings are loaded with ginger, chili, soy, sesame, and combined with local Kentucky soda – Ale-8-One. Yummy topped with thinly sliced scallions, then dipped in an Ale-8-One, honey, soy, and garlic butter sauce. Preheat oven 425°F. Set a cooling rack inside a foil-lined baking sheet. Whisk together seasoned salt, pepper, cornstarch, and 1 cup of Ale 8 until smooth. Using kitchen scissors, trim the tips from the wings and discard. Cut the wings in half at the joint and place in a plastic bag with the cornstarch mixture. Toss the wings to coat in the mixture and marinate for 30 minutes. Remove from the liquid. Set the wings aside and discard liquid. Combine the oil, salt, ginger and dried chili flakes in a large bowl. Add the wings and toss to coat. Place on the rack and roast, turning once for 40-45 minutes or until crisp and 165 degrees on a thermometer inserted into the thickest part of a wing piece. If the wings are not crispy, place under a broiler to crisp the skin. Melt the butter in a small saucepan whisk in the remaining Ale 8, soy sauce, honey, and garlic. Heat over medium heat until bubbling and slightly thickened. 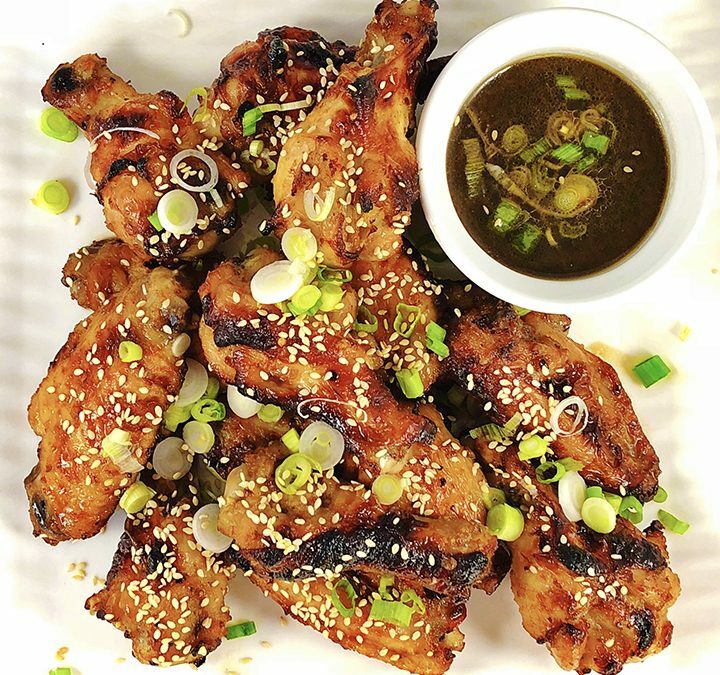 Toss the baked wings in half the sauce and sprinkle with scallions and sesame seeds on top. Place the other half in a small serving bowl and serve with the wings for dipping. Makes about 2 pounds wings. These sweet potato tarts can be a perfect Thanksgiving Leftover Makeover using cooked sweet potatoes. Great as an appetizer or snack, they are simple to make using frozen fillo dough cups filled with a quick and easy sweet potato mixture. Then finished with pecan topping and marshmallows, they are baked up to crunchy perfection in under 15 minutes. Preheat oven to 350⁰F. 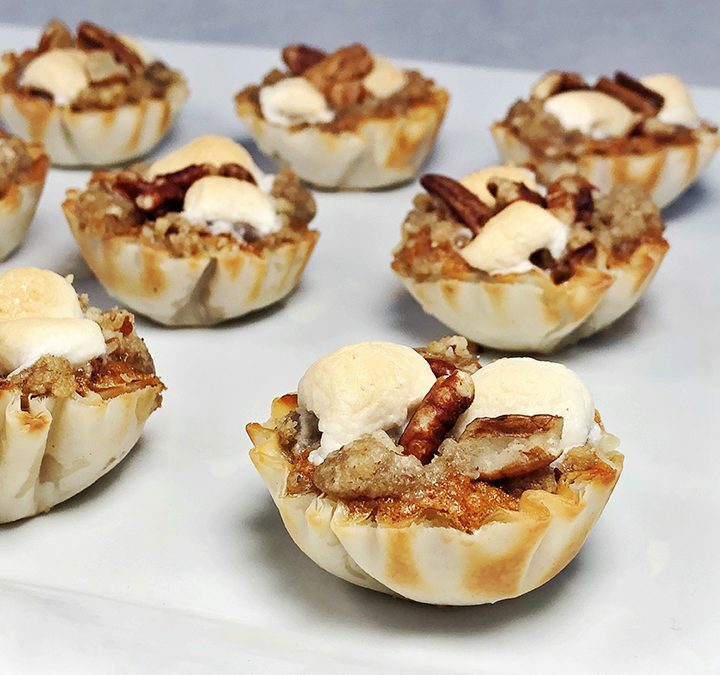 Put fillo dough cups on a parchment-lined baking sheet. Combine the sweet potatoes, brown sugar, butter, cream, vanilla, cinnamon, nutmeg, salt, and egg. Fill each cup ¾ full of the sweet potato filling. To make the topping: Combine the flour, sugar, pecans, salt, and butter, Top each with one teaspoon topping and a couple of marshmallows. Bake until marshmallows are lightly browned, 12-15 minutes. Serve immediately. Start your Halloween party with this easy, cheesy, stuffed pumpkin appetizer. The pumpkin is filled with Gruyere, Parmesan, toasted bread, and a creamy mixture with garlic, fresh sage, and cognac. 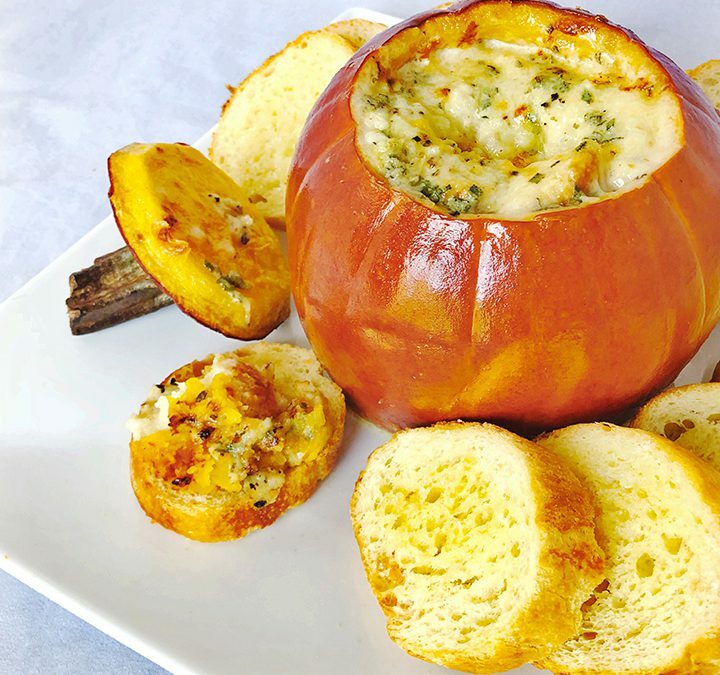 Then baked in the oven, the pumpkin serves as a serving dish as well as the walls get scraped into the delicious baked dip served on toasted baguette. Brush one side of the baguette slices with melted butter and top with a pinch of salt. Toast baguette slices in one layer on a baking sheet in oven until lightly browned, about 15 minutes. Remove and set aside. When cooled, cut 6-7 slices into cubes. Set aside and save the remaining slices to serve with the pumpkin. Using a knife, cut around pumpkin stem to make a lid and remove the top. Scrape out seeds and any loose fibers from inside the pumpkin. Lightly salt the inside of the pumpkin. Place pumpkin on a foil-lined sheet pan. Brush outside of pumpkin and lid all over with olive oil. Whisk together the cream, cognac, stock, pepper, sage, garlic cloves and ½ teaspoon of salt in a small bowl. Combine the cheeses together in another medium bowl. Start with a layer of the toasted and cubed baguette by adding ⅓ to the bottom of pumpkin, cover with ⅓ of the cheese. Continue layering the bread and cheese two more times. Whisk the cream mixture one more time, then pour into the pumpkin, stopping frequently to allow the cream mixture to soak in, until pumpkin is filled to within about ½” to the top. You may not use all the cream mixture, discard any remaining cream mixture. Cover pumpkin with its top. Place in the oven and bake until pumpkin is tender and filling is puffy, 55-60 minutes. To serve, scoop out some of the flesh with the cheesy filling on to the remaining baguette slices. 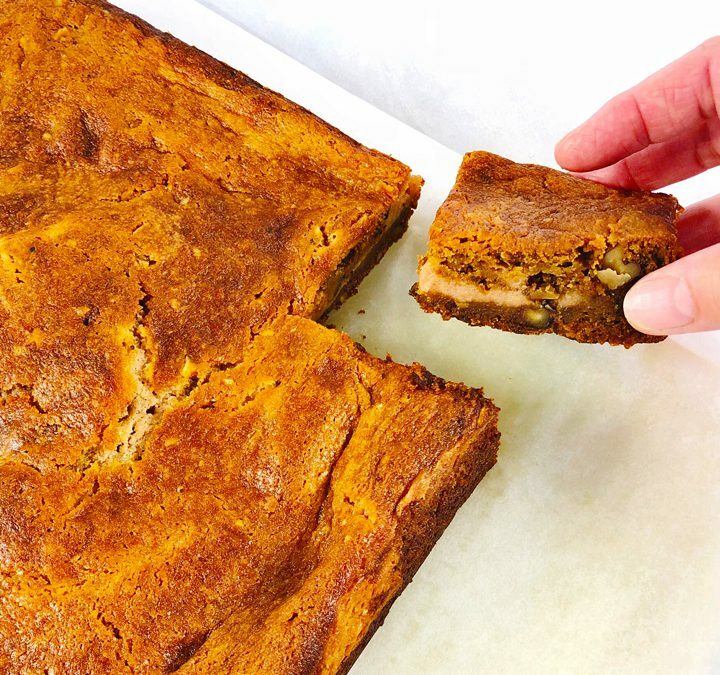 Get inspired during pumpkin season and fill your home with the fragrance of fall while these cinnamon swirl pumpkin bars bake away in your oven. Moist and delicious, we filled these bars with warm spices, a delicious cinnamon cream cheese, and toasted walnuts. Preheat oven to 350˚F. Place the walnuts on a baking sheet and toast in the oven for 10 minutes. Remove, (leaving the oven on) cool slightly, and chop. Set aside. To make the bars: Line bottom and sides of an 8×8“ baking pan with foil, leaving an overhang on all sides. In a medium bowl, whisk together the flour, ginger, allspice, nutmeg, cloves, baking soda, and salt; set aside. With an electric mixer, cream the butter and sugar on medium-high speed until smooth; beat in the egg and vanilla until combined. Beat in pumpkin puree then reduce speed to low, and slowly add the dry ingredients until just combined. Add the walnuts and stir into the batter by hand until incorporated. Spread mixture evenly in prepared pan. To make the cinnamon swirl: With an electric mixer, cream together the butter, cream cheese, and cream. Add the sugar, flour, cinnamon, and vanilla, then beat until combined. Drop in tablespoons over the pumpkin batter; swirl into the batter. Smooth the top and place in the oven. Bake until edges begin to pull away from sides of pan and a toothpick inserted in center comes out with just a few moist crumbs attached, 35 to 40 minutes. Cool completely in pan. Using the foil, lift from pan, peel off foil, and use a serrated knife to cut into 24 squares. You will be bringing your “A” game when you serve these crunchy, spicy, potato wedges at your next Tailgate or Football Watch Party. Crispy and drenched in a buttery Buffalo Hot Sauce, they are perfect for dipping in our cool Cilantro Ranch Dressing. Whisk together sour cream, mayonnaise, cilantro, chives, garlic, salt, and pepper in a bowl until well combined. Cover and chill for at least 1 hour, preferably overnight. 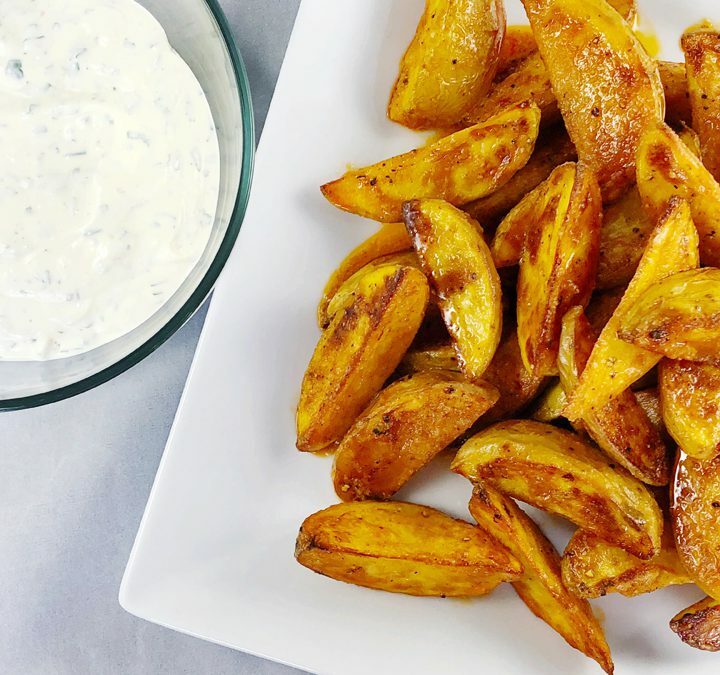 Cut each potato into 6 wedges, place in a large bowl, and toss with 2 tablespoons olive oil; add 1 teaspoon salt and ¼ teaspoon black pepper and toss again. Grease a baking sheet with olive oil and place the potatoes, cut side down, on the baking sheet leaving space between the wedges. Place in preheated oven and bake 20 minutes. Turn the potatoes, so the other cut side is down and cook 10 minutes longer or until golden. Turn the oven off. While the potatoes bake, combine the hot sauce, butter, vinegar, Worcestershire sauce, garlic powder, and ½ teaspoon salt in a small saucepan and place over medium heat. Whisk the sauce while bringing to a to a simmer. Continue cooking for 5 minutes, then remove from the heat, cover, set aside and keep warm. Combine the warm pepper sauce and hot potatoes in a large heatproof bowl and gently toss to coat evenly. Place the bowl of potatoes back in the warm oven and rest for 5 minutes. Remove and carefully toss again. Serve warm with the Cilantro Ranch Sauce.